As well as enjoying some R&E this week, we (my wife & sister-in-law) have visited a few places of interest in the area. On Tuesday we took a short trip to Lacock a village which has changed little in the last 200 years - apart from the high street populated with motor cars! Next week the Lacock High Street will be uncluttered with cars as filming for the 'Downton Abbey' film will be taking priority. We learnt the villagers (very democratic) vote on proposals for film/TV access to their village and fees paid by said film companies are divided between the village and the national trust. Below: Pictures taken by The English Apple Man of Lacock High Street on Tuesday (should have gone next week!!!! Lacock is also home to The Fox Talbot Museum which celebrates the invention of photography by William Henry Fox Talbot in 1839. On Thursday I drove to Wytham (near Oxford) to meet my friends Barrie Juniper and Sean Morris: Sean was twice a member of the winning crew for Oxford back in 1963 & 1965. 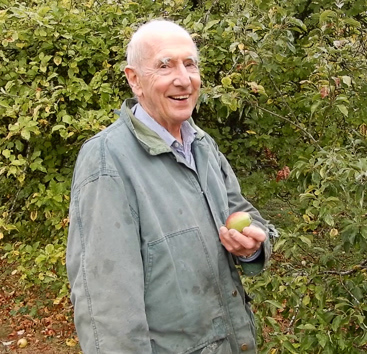 Barrie wrote the Story of the Apple following his visit to the Tian Shan 'fruit forests' in conjunction with David J. Mabberley. Barrie, a professor at Oxford was Sean's lecturer when he was at Oxford University in the 1960's. Barrie has around 50 varieties in his orchard: Orlean's Reinette an old French variety introduced in the 1770's with good flavour and an apple he describes as Ladies Finger of Bedlington, not a good eat but used as a decorative apple. Newton Wonder (my grandfather planted some in the 1930's). Leather Coat which Barrie describes as 'Shakespeare's Apple' - Brownlees Russet and Royal Russet (Brogdale Collection identifies them as one variety e.g. synonyms! Newton Wonder Parentage: Dumelow's Seedling x Blenhiem Orange - Raised by Taylor at King's Newton, Melbourne, Derbyshire, England. Introduced in about 1887 when it also received a First Class Certificate from the Royal Horticultural Society. Fruits have rather coarse-textured, moderately juicy flesh with a sub-acid flavour. Cooks very well. For a man more than half way through his 90th decade, Barrie has the most incredible brain and as one might expect plenty of stories to tell, all told with great eloquence. 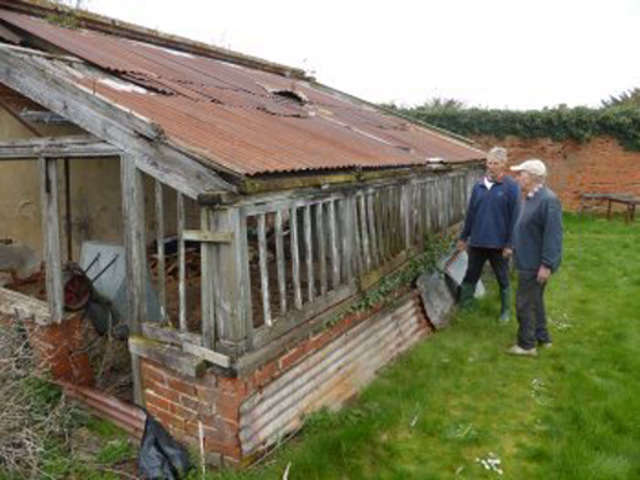 While the tour of his orchard and the many varieties within satisfied my inquisitive nature, Barrie was quite insistent that we see 'the old boiler room' used in days gone by to heat the three greenhouse (only one left and in a decrepit state) - Barrie is proud of his contribution to a 'historical' museum piece - as the old wooden stairs were dangerous, Barrie funded a new set of steps to this underground entity. The old orchard at my brother's is small, but has a very good mix of dessert apples, culinary apples and pears. In the garden, plums, gages and figs grow on the walls. In the paddock growing on the headland, Blackberries and Mirabelle plums. The mirabelle is a specialty of the French region of Lorraine, which has an ideal climate and soil composition for the cultivation of this fruit. This region produces 15,000 tons of mirabelle prunes annually, which constitutes 80% of global commercial production. Below: left; Gala apples from POLAND in Tesco today priced at 49p a pack right; price label - I dread to think what the grower received for his efforts? 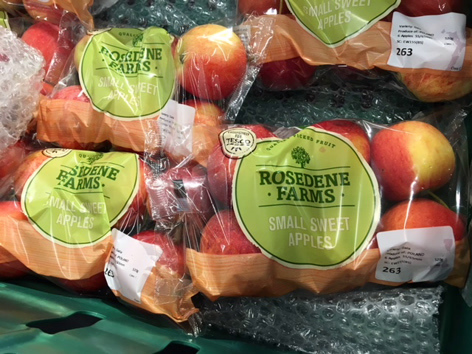 - the packaging seems deceptive; Rosedene Farms could easily be interpreted as English! This morning we visited Allington Farm Shop which stocks a 'plethora' of produce.